The report is also available as an Adobe Acrobat PDF file. To read this report, you will need the Acrobat PDF Reader, available free from Adobe. Welcome to Lawrence and the Douglas County fairgrounds. We have planned a great trip this year with many interesting workshops and collecting stops. We hope that you will read your guidebook. It has information that you will need this weekend. It includes a schedule of this weekend's activities as well as information on each of the field trip stops. We will divide the workshops into six groups. Each workshop will be repeated three times, each evening. This will give everyone a chance to attend each workshop. We have scheduled times for you to attend each workshop. We have tried to give the people that will only be attending one night, the workshops that they requested. However, if we missed scheduling you for a workshop, let Elizabeth Hemphill know and she will correct the oversight. LOOK FOR THE WORKSHOP SCHEDULE IN THIS GUIDEBOOK. We hope this makes a more rewarding workshop for all of you. The workshops will be in Buildings 1, 2, 21, and the Judging Arena, unless you are otherwise notified. A list of workshop locations is posted in Building 2, near where you registered. The people wearing the red "Leader" T-Shirts are guides and will be happy to assist you. These people will also be on the field trips and at the workshops to help you. They can assist you in finding the proper camping area or any workshop. We hope these T-shirts will make us easier to find. Restrooms are in Building 2, the arena, and the block building east of Building 2. The block building also has showers. After 10:00 PM, the Judging Arena will be closed. The Douglas County Sheriff will patrol the grounds periodically. Every precaution will be taken to protect your belongings but you are responsible for securing them and your vehicles. Tents can be left up for the weekend. We will leave the fairgrounds at 5:00 PM Friday to go to the Natural History Museum. You may caravan or go on your own if you wish at this time. Included in. this packet is a map of KU showing the location of the museum and parking areas. We recommend car pooling if possible. You will need to be at the museum entrance by 5:30 PM. The museum will not be open. We need to go in as a group. The museum will be staffed by Museum staff and students from the Kansas Geological Survey, so please thank them for their time. Also note that the Natural History Museum does not charge admission, but a donation box is available. We encourage you to give a donation to the museum. Around 6:00 PM Saturday, we will once again have our wiener/hamburger feast. It will be held at the picnic area east of the block building. Bring your appetites, wieners, hamburger, and salads or chips. On Saturday and Sunday mornings the buses will be in front of Building 2. Please be on the buses and ready to leave by 7:30 AM. We will leave at 7:30 sharp each morning. Each person should bring along a sack lunch both days, as there will be no opportunity to buy anything after we have started. Many places in Lawrence sell items for sack lunches. Small coolers will go under the seats. We will provide iced tea and water. Sunday morning "Chris Cakes" will feed us, starting at 6:15. He has promised that we will be ready to leave at 7:30. Please don't wait until the last to eat. We would like to encourage everyone to eat with us. The meal is only $2.00 for all you can eat. If you don't mark your registration for breakfast and wish to join us just let the registration table know and pay at that time. We may use part of a building that is currently under construction. Please keep all your family members away from the construction area. Please don't use the ballpark area north of the Extension Office. We appreciate your cooperation. During the general meetings we will be having drawings for items that various businesses have donated: assorted fossils, posters, gem stones, and many more fascinating items. Take a minute to fill out the evaluation form found in the back of this guidebook. This is the only way we have of evaluating the field trip. Feel free to write in any suggestions for improvements. Thanks again for coming and have fun. As is the case for all field trips of this type, many people come forth and volunteer their time and talents. Thanks go to Janet Baker, Pauline Denham, Sara Marcus, Jennifer Edwards, David Leek, Tom Stanley, and Jon Garbisch for expert help with the fieldtrip and workshops. Workshops conducted by Glenn Rockers (PaleoSearch, Hays, Kansas), Lloyd Hemphill, and Larry Floatman are much appreciated. Planning and early stages of work owe much to the efforts of Bill Dymacek, Mike Magnuson, Mike Bronoski, Will and Pat Gilliland, and, especially, Alan DeGood. Finally, a special thanks to Lea Ann Davidson, without whom this guidebook would not have been ready. 1. Find the giant "tree stump" and write its name here. 2. What color does the specimen of fluorite from England glow under ultra-violet light? 3. Find one thing on the "What is a Fossil" display that is not a fossil. 4. Find what is falling through the entrance of the model of the natural trap cave. 5. 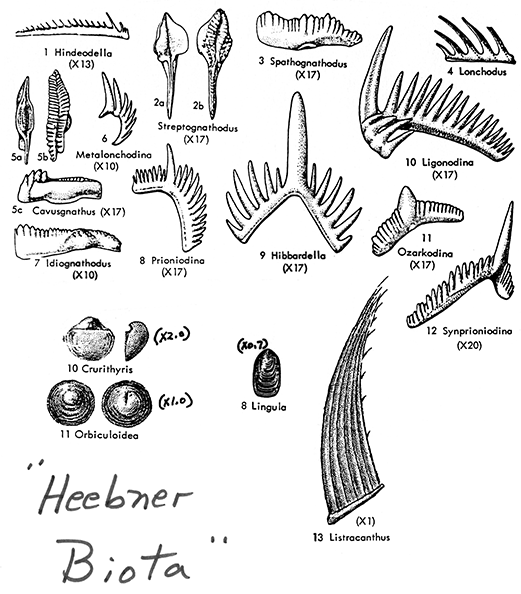 Sandbars on the Kansas River between Topeka and Kansas City produce fossils from what age? 6. Find the first bird. Give its name. 7. Find the geologic map of Kansas display. Locate your county (approx.) and write the period or periods exposed there. 8. Find if the tar pits contained more carnivores and scavengers or plant eaters and why. 9. Last year's state field trip went to the Niobrara chalk beds. When were they deposited? 10. 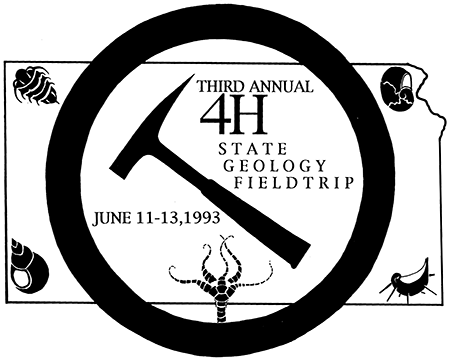 This year's field trip will take us to the rocks mostly deposited in the Pennsylvanian and Permian periods. Are they younger or older rocks than seen on last year's trip? 11. North America was separated by the Cretaceous sea 70-100 million years ago. What were the waters like? 12. Pterosaurs, extinct flying reptiles, developed true flight. What size were the smallest and largest pterosaurs? Bonus: Visit the bee tree. Are they awake or asleep? We have rented buses to help relieve the pressure of losing someone along the way. We have a few rules that need to be followed to insure a safe and comfortable trip. You may choose which bus to ride on. Once started you may not change buses. Everyone needs to ride a bus **except to the museum on Friday night. ** Look for map of KU. Know when your bus is scheduled to leave. Be on it. They may not all leave stops at the same time. There will not be room on other buses for you. You may have back packs and small coolers on buses. They will go under the seats or you can hold the backpack. The buses will leave at 7:30 AM both Saturday and Sunday. Buses need to be free of trash and rocks when we leave the bus at the end of the day. We will have trash bag on the buses. Douglas County is in northeastern Kansas, in a large region of North America that geologists refer to as the Stable Interior. It is a region that generally lacks mountains and a history of mountain building and earthquakes. Compared to places like California and even the Appalachian region of the eastern U.S., this area has been geologically quiet. This doesn't mean that the area lacks a geologic history. It has its own story, revealed in the underlying rocks and landscape. As we examine these more closely in the field, this geologic story will become more apparent. Douglas County occupies a part of a large area with similar landscape or appearance this is called a physiographic region. Geomorphologists are geologists who specialize in the study of landforms. They have mapped the country into regions of similar landscape. Douglas County is in a region known as the Osage Cuestas that occurs in eastern Kansas and parts of western Missouri and northeastern Oklahoma. Physiography is determined by the type of rocks that occur in an area and their structure. In this part of the midwest, the rocks were deposited during the Pennsylvanian Period of geologic time, roughly 300 million years ago. During this time, a persistent shallow sea occupied much of the central U.S. The depth of this sea=although never great-continually changed during this time, going up and down like a very slow moving yo-yo. When the sea was very shallow, land was nearby and clay and sand were deposited by streams and rivers. In some cases swamps formed, lush with vegetation. When sea level rose, these areas were buried, the clays were compacted into shales, the sands cemented into sandstone, and swampy vegetation was compacted and eventually, after long burial, converted into coal. As the seas got deeper the water became clearer and marine organisms thrived. Many of these produced calcareous shells and other hard parts that built up on the sea floor after their death. These materials were also buried by later sediments forming calcareous rocks bearing fossils that we recognize as limestone. When the sea was the deepest, little sunlight reached the bottom and little oxygen was dissolved in the water. Organic remains that filtered to the bottom did not decompose and very fine sediment that washed in combined with the black organic goo to form black shale. This sequence was repeated many times during the Pennsylvanian Period created numerous repeating sequences of shale, limestone, shale, limestone, etc. Geologists call these sequences cyclothems because of the cyclical nature of their repetition. Of these rocks, limestones are generally the hardest and most resistant to erosion, whereas shales are soft and easily weathered away. In eastern Kansas this whole sequence has been tilted very slightly by the uplift of the Ozark Dome in southeastern Missouri. As a result they dip to the west-northwest at a very small angle. Erosion has carved these rocks into a series of tilted plateaus that are capped by the resistant limestones. These tilted plateaus go by the Spanish word cuesta, which means slope, and the region is known as the Osage Cuestas because of the Native Americans that once lived here. One of the more prominent cuestas in Kansas is formed by the Oread Limestone, named for Mount Oread, home to the University of Kansas and visible 1.5 miles northwest of the fairgrounds. We will see the rocks of the Oread Limestone exposed along the turnpike at the crest of the first hill after we cross the Kansas River on the first day of the field trip. The Oread Cuesta can be traced from Northeast Kansas to Oklahoma, as can a number of other cuestas formed on other resistant limestones. As we travel west on the turnpike we will pass through many road cuts that at first glance appear to be the same rocks. In fact we will be seeing similar sequences of different rocks--cyclothems. As we head west we will climb onto one cuesta after another, progressively onto younger and younger rocks. We will pass the boundary into rocks of the Permian Age. However the shale-limestone-shale sequence will continue into the Flint Hills. We will also climb topographically. The Kansas River in Lawrence is about 800 feet above sea level. At our highest point in the Flint Hills we will have climbed 600 feet to an elevation of 1400 feet above sea level. One fairly recent event, the Ice Age, has also helped shape this area. Four distinct Ice Ages occurred in the past two million years. The second one, roughly 750,000 years ago, covered all of Kansas north of the Kansas River and east of the Blue River. The fairgrounds are built on deposits left by the glacier, known as the Kansas Glacier. Because this glaciation was so long ago, glacial features like drumlins, eshers, and other depositional landforms left by the Kansas glacier have been destroyed by erosion, but debris left behind by the glacier still blankets many parts of northeast Kansas. We will see some of these deposits in the field. The glaciers also rearranged the drainage of northeast Kansas resulting in changes in streams levels and their courses. Finally, as we look at the hills and valleys that comprise the area today we should keep in mind that the primarily sculpturing agent responsible for producing the scenery we see today is running water. Hopefully, sculpturing by running water, especially rainfall will be held to a minimum during the field trips. In the time since human settlement, northeastern Kansas and Douglas County have witnessed much history. From at least the 1600s to the early 1800s, this part of Kansas was home to the Kansa Indians, the tribe that supplied the name for the state. The word Kansa has been spelled and translated in various ways, but it is generally taken to mean "people of the south wind." Various Native American tribes were moved into northeastern Kansas in the 1800s. Douglas County was included as part of the Shawnee Reserve, which was established by treaty in 1825. When white settlement began in the western U.S., this area was along two famous routes west. The Oregon Trail enters Kansas in Johnson County, runs through Douglas County and Lawrence, then heads west and north. Ruts from the trail are visible west of Lawrence near old U.S. Highway 40. The Santa Fe Trail cut through southern Douglas County, roughly following today's U.S. Highway 56, and ruts from that trail are visible east of Baldwin City near Black Jack Park. In 1854, with the passage of the Kansas-Nebraska Act, Kansas was made a territory and opened for white settlement. Lawrence was founded in that same year by the New England Emigrant Aid Company and was named after Amos A. Lawrence of Boston. The town was meant to be a stronghold for those who favored the abolition of slavery; its creation was designed to help Kansas enter the Union as a free state. Douglas County, created in 1855, is named for Stephen A. Douglas, an Illinois Senator and author of the Kansas-Nebraska Act. Because Lawrence was an abolitionist stronghold, citizens of the town regularly confronted pro-slavery people from nearby communities, such as Leavenworth or Lecompton (a small town west of Lawrence, along the Kansas River, that was designated to be the state capital if Kansas had been admitted as a slave state). In 1856, pro-slavery forces burned several houses in Lawrence. In 1863, two years after Kansas had been admitted to the Union as a free state, Confederate guerrillas led by William Quantrill rode into Lawrence from Missouri, burned much of the town, and killed 150 people. Many of the original buildings in Lawrence were located in North Lawrence (across the Kansas River from the main part of town), along Massachusetts Street (the town's main street), and west of Massachusetts in a part of town that is known as old West Lawrence. A number of large, historic homes are still found in this neighborhood. The hill to the south of Old West Lawrence was originally known as Hogback Ridge. Today it is more grandiloquently called Mount Oread, and it is the home of the University of Kansas, founded in 1866. In 1884, Haskell Indian Junior College was founded in Lawrence, and it remains a center for Native American education. Lawrence today has grown into city of more than 65,000. It is the state's fourth-largest city, after Wichita, Kansas City, and Topeka. KU has grown substantially from its original enrollment of 55 to more than 20,000 students on the Lawrence campus and branch campuses of the medical school in Kansas City and Wichita. The Kansas Geological Survey, established in 1889 as a division ofKU, is located on the University's West Campus, at the intersection of 19th and Iowa Streets. A few hundred yards north of the Survey is Pioneer Cemetery, the resting place for many of the victims of Quantrill's infamous raid and for many KU professors, including Raymond C. Moore, director of the Survey from 1917 to 1954, and the source of the name for the building that houses the headquarters of today's Kansas Geological Survey. Some of the stops we will make during the field trip will be in Pennsylvanian and Permian rocks of eastern Kansas. Your guidebook mentions other rock units as we drive by. Most of the rock units that we will drive by and visit are shown here on this stratigraphic column (from Zeller, D.E., ed., The Stratigraphic Succession in Kansas: Kansas Geological Survey Bulletin 169 [available online]). Units that we will examine in detail are noted by *. On the following logs, the first number represents total-elapsed mileage; the second number represents the milepost number for the highway (where applicable). Remember that Kansas highways are numbered from west to east and south to north, so that milepost numbers get progressively larger as you go from west to east, and from south to north. Portions of the following road log are from Roadside Kansas: A Guide to its Geology and Landmarks by Rex Buchanan and James McCauley (University Press of Kansas, 1987). 0.0 Leave Douglas County Fairgrounds and proceed north on Harper Street. 0.2 19th Street. Turn west. 0.7 Haskell Street. Turn north. This street is named after Haskell Indian Junior College, located at 23rd and Haskell. This two-year school draws native American students from around the country. 2.3 New Hampshire Street. Turn north. Many of Lawrence's north/south streets are named after states. Because the city was founded by abolitionists from Massachusetts, it is appropriate that the main street is named after that state. 3.0 Massachusetts Street and Lawrence City Hall. Turn right and cross the Kansas River. Note the large Sioux Quartzite boulder between the two bridges. The north-bound bridge passes over Bowersock Dam. 3.3 North Lawrence. Unlike the rest of Lawrence south of the river, which sits on higher ground, north Lawrence sits on the floodplain of the Kansas River. The most disastrous flood on the Kansas River occurred in 1951 and most of north Lawrence was underwater. The elevation here is 820 feet above sea level. 4.3 Kansas Turnpike Entrance. Turn right, get a turnpike ticket, and follow the signs for I-70 west. 5.0 Enter I-70 west and proceed west to exit 338 a distance of 49.4 miles. 5.5 (203.0) The Kansas River looks wider and deeper here than at other places along its course, primarily because it is impounded a little more than a mile downstream by Bowersock Dam. Bowersock is the only dam on the Kansas River and the only hydroelectric dam in the state. It has the capacity to produce just under two megawatts of electricity. At Lawrence, the first bridge across the Kansas River was completed in December 1863. Construction was held up when eight members of the building crew were killed in Quantrill's raid. When the wooden bridge was finally finished, the construction company charged a toll of 25 cents per trip. Because of its sandy bottom and its connection to the Mississippi River via the Missouri River, the Kansas River is home to several species of fish that are rarely found elsewhere in Kansas. Sturgeon, lamprey, and eels have all been taken from the Kansas River, although such fish are rarely caught today. 6.6 (201.9) West Lawrence interchange. This exit connects to U.S. Highway 59, which runs south along Lawrence's west side. 9.5-9.9 (198.6-199.0) Oread Limestone, one of the most prominent formations in eastern Kansas, averages about 52 feet in thickness in the northern part of the state. The Oread was named for Mount Oread, the hill that overlooks downtown Lawrence. Mount Oread, also the home of the University of Kansas, is capped by Oread Limestone. The hill's name came from the home of Eli Thayer, a Massachusetts resident who was one of the foremost promoters of the New England Emigrant Aid Society, which helped to settle Kansas in the 1850s. Mount Oread was the name of Thayer's home; he also operated the Oread Female Seminary near Worcester, Massachusetts. 10.4 (198.1) Plattsmouth limestone. The Oread Formation is made up of four smaller limestone layers. The Plattsmouth limestone is the thickest of those limestones. 11.7-12.9 (195.6-196.8) Numerous outcrops of Lecompton Limestone. 13.5 (195.0) Tecumseh Shale, overlain by Deer Creek Limestone. 14.7 (193.8) Tecumseh Shale, overlain by Deer Creek Limestone. This shale layer is up to 65 feet thick near the Kansas River. 15.2 (193.3) Deer Creek Limestone. 15.5 (193.0) Lecompton is visible to the northeast. This small town was once the capital of territorial Kansas and was known as a proslavery stronghold. Today, bald eagles often roost in the winter in the trees along the Kansas River near Lecompton--in fact, the town was once called Bald Eagle. 19.0 (189.5) The town of Big Springs, south of the highway, is named after a series of springs that flowed near here. Also at about this point the road crosses a feature that geologists call the Big Springs Anomaly. According to precise measurements by geophysicists, magnetic levels in this area are significantly higher than in the surrounding countryside. These readings are intriguing because they give clues about the subsurface. For example, the Big Springs Anomaly indicates that the underground igneous rock contains more magnetite than in other areas, producing the higher magnetic readings. Geologists have mapped magnetic levels across Kansas; they use the information to explore for oil and gas and to understand the geologic history of Kansas. 19.1 (189.4) Calhoun Shale, overlain by Topeka Limestone. 20.0 (188.5) Shawnee/Douglas county line and the Oregon Trail crossing. Here I-70 passes over U.S. 40, which was one of the major east-west routes through Kansas before the days of the Interstate highway system. Between Topeka and Lawrence, U.S. 40 closely follows the path of the old Oregon Trail. When gold was discovered in California in 1848, traffic along the Oregon Trail increased. One branch of the trail ran from Independence, Missouri, to Topeka, then northwest to Marysville, and into Nebraska; its course would have crossed I-70 at about this point. Although wagon ruts are not visible at this location, they can be seen along a number of wagon trails and stage trails that cross the state. (187.0-187.3 & 187.9) Topeka Limestone, which is named for the Kansas capital, is 33 to 55 feet thick. 22.2 (186.3) Deer Creek Limestone. 22.7 (185.8) Deer Creek Limestone. 22.9 (185.6) Calhoun Shale, overlain by Topeka Limestone. 23.8 (184.7) Tecumseh Creek flows into the Kansas River 1.5 miles north of here, near the town of Tecumseh, which was named after the most famous of the Shawnee Indian chiefs. 23.9 (184.6) Deer Creek Limestone. The Ervine Creek Member of the Deer Creek Limestone is 14 to 18 feet thick in this area. It has been extensively quarried south of the highway along Tecumseh Creek. 24.5-24.8 (183.7-184.0) Calhoun Shale overlain by Topeka Limestone. 25.1 (183.4) Stinson Creek is named after the founder of the town of Tecumseh, which is situated near the stream's mouth. 25.2 (183.3) Ervine Creek limestone, which is the uppermost member of the Deer Creek Limestone, is exposed on the south side of the eastbound lane of I-70. 25.5 (183.0) Topeka service area. 25.7 (182.8) Topeka Limestone is exposed on the north side of westbound I-70. 26.7 (181.8) East Topeka interchange. To the east, I-70 and the Kansas Turnpike continue to Lawrence and Kansas City. To the southwest, the turnpike leads to Emporia, Wichita, and Oklahoma. 26.9 (181.6) Kansas Turnpike tollbooth. 27.7 (364.8) Deer Creek, which is dammed 1.5 miles to the south to form Lake Shawnee. The Deer Creek Limestone is named after exposures along this stream. 30.0 (362.5) Tenth A venue exit. The Kansas Statehouse and other state office buildings are accessible from this exit. Construction on the Kansas Statehouse began in 1867, using Fort Riley limestone, quarried near Junction City (outcrops of the Fort Riley can be seen at milepost 306). Construction on the west wing began in 1869, using Cottonwood limestone, dug near Cottonwood Falls in Chase County. Located on a 20-acre square in the center of Topeka, the Statehouse features murals by John Steuart Curry on its second floor. Since Kansas was organized as a territory in 1854, the legislature has met at four locations in addition to Topeka. The 1855 legislature, called the Bogus Legislature because many of its members were elected by pro-slavery Missourians, met at Pawnee in Fort Riley and at Shawnee Mission. Later legislatures met at Lecompton and Lawrence, before Topeka was voted the permanent state capital. 31.1 (361.4) The twin spires of St. Joseph's Catholic Church are visible south of the highway. 32.9 (359.6) Here I-70 crosses Ward Creek, which flows a short distance north and empties into the Kansas River. The Kansas, or Kaw, drains almost all of northern Kansas, eastern Colorado, and most of Nebraska south of the Platte River. The Kansas begins at the confluence of the Republican and Smoky Hill rivers near Junction City and empties into the Missouri River at Kansas City. Other rivers that drain into the Kaw include the Solomon, Saline, Delaware, Blue, and Wakarusa. In all, the Kaw drains a watershed of more than 60,000 square miles, carrying an average of 4.75 million acre-feet of water per year. In northeastern Kansas, where groundwater supplies can be rare, the Kaw is an important water source, and it is no accident that many of the state's major cities--Topeka, Lawrence, Kansas City--are perched on its banks. 34.2 (358.3) Just north of I-70 is a view of the Kansas River. This is also the westbound exit for Gage Boulevard. One mile south is Gage Park and the Topeka Zoo, which is noted for its tropical rain forest and its gorilla exhibit, which allows zoo-goers to walk through a glass-enclosed tunnel in the gorillas' cage. 34.5 (358.0) Interchange for U.S. 75, which exits to the north and joins I-70 for a short distance to the west. The eastbound exit for Gage Boulevard and Gage Park is at this interchange. 35.4 (357.1) On the hill to the north is Cedar Crest, the official residence of the governor of Kansas. 35.9 (356.6) North of I-70 is the Menninger Foundation, a nationally known center for the treatment of and research into psychiatric disorders. The main building, which is modeled after Independence Hall in Philadelphia, contains a collection of Sigmund Freud's papers. 36.4 (356.1) Exit for Wanamaker Road and U.S. 75 By-pass South. The Kansas Museum of History and the Menninger Foundation are accessible from this exit. 37.1 (355.4) The Kansas Museum of History, operated by the State Historical Society, opened in 1984 with exhibits related to the history of Kansas. 37.3 (355.2) I-470 interchange. This road loops around the western and southern edges of Topeka before intersecting with the Kansas Turnpike and I-70. 38.1 (354.4) Burlingame Limestone Member of the Bern Limestone. Fusulinid fossils and algal remains are common in this limestone layer, which ranges in thickness from 1 to 25 feet. 39.4 (353.1) Kansas Highway 4 interchange. This highway cuts through the Flint Hills south of I-70. 39.7 (352.8) Auburn Shale, overlain by the Emporia Limestone. 41.1 (351.4) Blacksmith Creek, a small creek that joins Mission Creek and drains into the Kansas River. 41.2 (351.3) Here the road passes through a hill called Hickory Knob. Along the road, the Scranton Shale is overlain by the Bern Limestone. (348.8 & 349.1) Zeandale Limestone, which was named for a small town east of Manhattan. Zea is the Greek word for grain, and that part of the Kansas River valley was known as Zeandale Bottoms. 44.1 (348.4) Willard Shale, overlain by Zeandale Limestone. 45.2 (347.3) Willard Shale overlain by the Tarkio Limestone Member of the Zeandale Limestone. This Pennsylvanian limestone is gray, but it weathers to a deep yellow-brown. It is characterized by an abundance of large fusulinids. 46.5 (346.0) Wabaunsee/Shawnee county line. Wabaunsee County was named for a Potawatomi chief whose name meant "Dawn of Day." This area was once part of a 900-square-mile Potawatomi reservation that stretched 30 miles north and west from Topeka. A 120-square-mile Potawatomi reservation still exists about 15 miles to the north, in Jackson County. The Potawatomi language has provided what is probably the best-known Indian phrase in America--"kemo sabé--which means faithful friend and was used by television's Tonto in reference to the Lone Ranger. 48.1 (344.4) Dover Limestone Member of the Stotler Limestone. 50.3 (342.2) Pillsbury Shale, overlain by the Stotler Limestone. The Pillsbury Shale often contains a thin bed of coal. 50.5 (342.0) Keene Road exit. Taken south, this road intersects with K-4, which meanders through the Flint Hills. K-4 passes through Eskridge--a town that bills itself as the Gateway to the Flint Hills-sand past a pretty manmade reservoir called Lake Wabaunsee. Buffalo Mound is clearly visible on the western horizon. 52.1 Brownville limestone, overlain by Towle shale. This marks the easternmost exposure of Permian rocks along I-70. To the east, I-70 passes over Pennsylvanian rocks, which are generally alternating limestones and shales, with occasional sandstones and thin seams of coal. Thicker, economically important coal beds of Pennsylvanian age are found in southeastern Kansas. 52.7 (340.4) Brownville Limestone Member of the Wood Siding Formation, overlain by the Towle Shale Member of the Onaga Shale. In this outcrop the Brownville limestone, which is actually bluish-gray, is stained red by the overlying red-colored Towle shale. The contact between these two units is defined as the boundary between rocks of Pennsylvanian age, below, and younger strata of Permian age, above. The contact between these two units appears conformable. That is, there is no drastic change from the rocks of Pennsylvanian age to those of Permian age, probably because there was no interruption of deposition. In other locations, Indian Cave sandstone may occur at the base of Towle shale and may cut down into the underlying Pennsylvanian rocks. Indian Cave sandstone, which marks the beginning of Permian deposition, is exposed about 8 miles southeast of here in the banks of Mission Creek at a location called Echo Cliffs. 53.5 (339.0) At this point the road passes an exposure of Janesville Shale and crosses Buffalo Mound. At 1,273 feet elevation, this hill is more than 300 feet above Mill Creek valley, just to the north. It was reportedly named because its shape resembles a buffalo's back. Geologists consider Buffalo Mound a landmark on the eastern edge of the Flint Hills. It is capped by Grenola Limestone, and its outcrops are good locations for collecting fusulinid fossils. 54.4 Stop 1 Exit 338 (Vera Road exit). Park on the I-70 Exit ramp. The West Branch shale is overlain by the Five Point limestone, both members of Janesville Shale, which is exposed at this exit. In the northwest corner of this intersection is an unnamed coal bed in the West Branch shale that we will examine. Coal beds are much more common in the older Pennsylvanian rocks of eastern and southeastern Kansas. From Stop 1 proceed south on the gravel road. The elevation here is 1010 feet. 56.0 Dog Creek. Dog Creek flows in to Mill Creek 3 miles north of here. 57.0 Road cut in the Roca Shale. 57.5 The road crests a ridge at an elevation of 1273 feet, the same elevation as Buffalo Mound. The low flat-topped hills just east and west of the road are capped by the Cottonwood limestone member of the Beattie Limestone. In Kansas, the elevation generally increases as you move from east to west across the state. The increase in elevation is due to the uplift of the Rocky Mountains to the west and the additional layers of sediment on the High Plains of western Kansas. The lowest point in Kansas is south of Coffeyville in southeastern Kansas, where the elevation is about 688 feet. The high point is Mount Sunflower in Wallace County near the Colorado border where the elevation is 4039 feet. 59.3 Stop 2. Johnson Shale. Here we will examine a number of Permian fossils and collect geodes that are weathering out of the outcrop. 60.2 Snokomo School House. This school house was built in 1883 and is named for Snokomo Creek a short distance west of the road. 61.3 Cottonwood limestone is exposed on the east side of the road (elevation 1300'). 62.7 Turn west onto Skyline Scenic Drive. 67.7 Here the road climbs on a ridge capped by the chert-bearing Wreford Limestone and follows the drainage divide between Kuenzli Creek to the east and Mill Creek to the west. 71.4 This large radar dome houses the antenna for the NEXRAD radar system of the U.S. Weather Service. This is the most advanced radar system yet developed to view and interpret severe storms. It is a doppler radar system which can detect rotation and wind shear in thunderstorms and can be used to give more accurate warnings of approaching severe storms. This radar will cover all of northeastern Kansas and adjacent areas and will soon be operational and used on local television weather reports. 71.5 Nearby are oil wells in the Steuwe oil field. 72.4 The road drops into the Mill Creek Valley passing through outcrops of the Funston Limestone. 73.7 Stop sign. This crossroad is known as Allendorph. 74.2 South Branch Mill Creek. 74.4 Stop sign on Kansas Highway 99. Turn north. 74.9 West Branch Mill Creek. This stream joins the South Branch of Mill Creek a short distance downstream to form Mill Creek. Mill Creek drains much of Wabaunsee County and flows into the Kansas River northeast of Maple Hill. 75.6 Alma, the county seat ofWabaunsee County. 76.8 North edge of Alma. Here K-99 follows the west boundary of the former Potawatomi Indian Reservation. 77.8 The road to the east leads to McFarland. 80.9 Pretty Creek. During the Ice Ages the Kansas glacier advanced southward to this area. It occasionally dammed up the Kansas River a few miles to the north creating large ice-margin lakes. When the water got high enough, it occasionally spilled out of the Kansas river valley into adjacent watersheds. Geologists believe that at one time Kansas River water spilled into this stream and flowed southeastward into what is now Mill Creek. 84.2 The hill east of the highway is capped by thousands of Sioux Quartzite boulders carried southward from South Dakota by the Kansas glacier and left behind after the glacier's retreat. Quartzite is a metamorphic, rock, formed when sandstone is placed under intense heat and pressure. Most rocks at the surface of Kansas are sedimentary rocks; igneous and metamorphic rocks are rare. In some of these chunks of quartzite, it is possible to see lines that show where the layers of sandstone were originally deposited. 86.7 This break in the landscape separates the Buck Creek terrace above from the Newman terrace below. Terraces represent former floodplains of rivers when they flowed at higher elevations. The Buck Creek terrace was formed during the Illinoisan glacial period, while the younger Newman terrace was formed during the Wisconsinan glacial advance, which was the latest one. 89.3 Kansas River. River elevation is 980 feet. Here the Kansas River is 180 feet higher than it is in Lawrence. Since there are 75 river miles between here and Lawrence that gives an average gradient or drop of 2.4 feet per mile. This is much less than the gradient of a mountain stream but much larger than some large meandering rivers such as the Mississippi. Below Cairo, Illinois, the Mississippi drops at a rate of between 0.1 and 0.5 foot per mile. 89.5 Two blocks north of the river turn east. 89.7 Proceed to the Wamego City Park where we will stop for lunch and visit the historic windmill. Stop 3. 96.1 Following lunch return to K-99, turn south and backtrack 6 miles to a gravel road leading east. 97.8 Stop 4. Here we will examine Sioux Quartzite erratics brought south by the Kansas glacier. 98.6 Turn south at cross roads. 102.1 Junction with I-70 take I-70 east and return to Lawrence. On the following logs, the first number represents total elapsed mileage; the second number represents the milepost number for the highway (where applicable). Remember that Kansas highways are numbered from west to east and south to north, so that milepost numbers get progressively larger as you go from west to east, and from south to north. Portions of the following road log are from Roadside Kansas: A Guide to its Geology and Landmarks by Rex Buchanan and James McCauley (University Press of Kansas, 1987). 0.3 23rd Street. Turn west (or right). 1.2 Haskell Avenue. Haskell Indian Junior College to the south. 2.8 Iowa Street/U.S. Highway 59. Turn south (or left). 4.0 33rd Street. To the east is Lawrence's new Wal-Mart, which bills itself as a "environmental Wal-Mart." Recycled materials were used in construction; it also serves as of a drop-off point for recycling plastic, glass, paper, and other materials. To the west is Floyd's Bait Shop. 5.0 Wakarusa River. This river is dammed a few miles to the west, forming Clinton Reservoir. The Wakarusa joins the Kansas River near Eudora. 6.5 Shank Hill. Most of the hills in this area are capped by the Oread Formation, the same unit the caps Mount Oread at KU. 8.7 Toronto limestone, a thick, blocky member of the Oread Limestone, overlain by the Plattsmouth limestone. Most of the limestones and shales we will see today were deposited during the Pennsylvanian Period of geologic history, about 300 million years ago, at the bottom or along the margin of a shallow sea. Many of the rocks we will see to the south are from the same formations as those around Lawrence. These Pennsylvanian rocks are exposed at the surface in a northeast-southwest trend across the state. 8.8 Leavenworth Limestone Member of the Oread Formation. 9.0 Pleasant Grove. Guenther's salvage yard to the east. 14.0 Junction between U.S. highways 56 and 59. The Ireland sandstone, the remains of sand deposited in a Pennsylvanian river channel, crops out just to the west and along Tauy Creek, where it forms a landmark called Hole in the Rock. 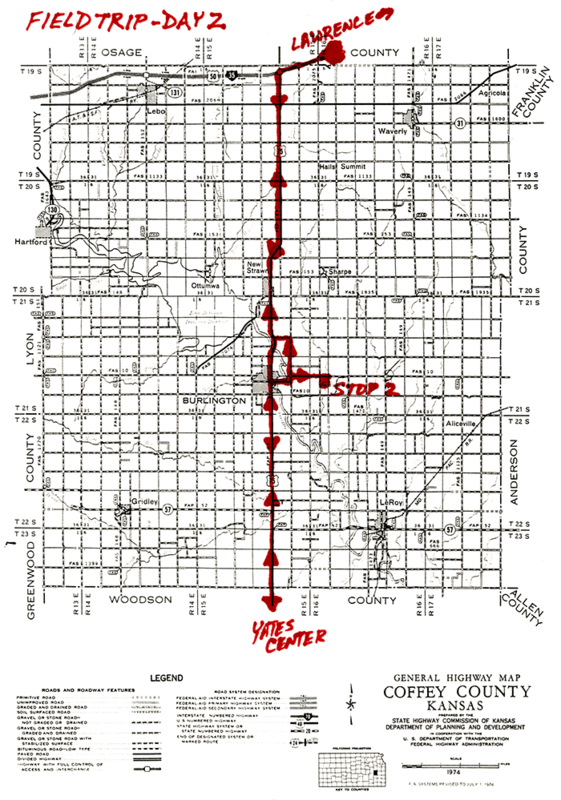 U.S. 56 cuts diagonally across Kansas, generally following the path of the old Santa Fe Trail. 17.1 Douglas County/Franklin County line. 24.4 Ottawa city limits. Ottawa is the seat of Franklin County and the boyhood home of Gary Hartpence, also known as Gary Hart. 25.2 Intersection with Kansas Highway 68. Turn right. The highway curves to the south. 25.6 Marais des Cygnes River. This river's name is French for "marsh of swans." 26.7 Stop sign. Continue straight, or south, on county road. 29.3 Interstate Highway 35/U.S. Highway 50. Turn west, or right, onto 1-35. (180.0-182.0) In these two miles the highway passes through the Sand Hills. Unlike the sand hills of central and western Kansas--which are composed of geologically young windblown sand dunes--these hills are made up of sandstone that was deposited in a large river valley during the Pennsylvanian Period. This Tonganoxie sandstone is more than 140 feet thick in places. The old river valley where the sand was deposited followed a southwestward course, 12 to 20 miles wide, from Leavenworth County to Greenwood County. The Tonganoxie today is an important water-bearing formation in this part of Kansas. Most of the bedrock units here are limestones and shales that yield little or no water when wells are drilled into them. Because sandstone has abundant pore spaces between the particles of rock, it is conducive to the accumulation and pumping of water. 32.9 (179.1) Mud Creek. The elevation here is 920 feet. 34.0 (178.0) One mile to the northwest are the Chippewa Hills, which are capped by Oread Limestone. These hills were named after the Chippewa Indians, who lived on a small reservation in this area during the 1800s. The Chippewas were originally from Michigan, but in 1839 they moved to this 8,320-acre reservation. In 1859 the Chippewas were united with another tribe, the Munsies, who were making their second attempt to settle west of the area of white encroachment. The Munsies were originally from the upper Delaware valley of New York, New Jersey, and Pennsylvania; they had been moved to Ontario, Canada, before coming to Kansas. The Munsie Indian cemetery, established in 1857, lies in the hills north of the highway. 35.3 (176.7) Exposure of shale in the Lawrence Formation on the north side of the highway. 35.6 (176.4) County road south to Homewood. 39.4 (173.0) Southeast of the highway is the small town of Ransomville, the site of a shaft mine that operated during the 1890s and early 1900s, producing coal from the Williamsburg bed. This mine used a horse-powered hoister and provided coal for trains along the now-abandoned Santa Fe line that operated between Ottawa and Emporia. 40.7 (171.7) Plattsmouth limestone on the north side of the highway. 41.1 (171.3) Coal Creek, named after exposures of the Williamsburg coal bed. The Williamsburg was the source for most of the coal mined in Osage and Franklin counties; production from this layer totaled about 90,000 tons, most of which was mined in the late 1800s. Recent studies show that the Williamsburg is extremely low in sulfur-only about 1 or 2 percent-which makes it an environmentally attractive coal, particularly because many coal layers in Kansas are high in sulfur and require expensive pollution-control equipment if they are to be burned. In spite of the Williamsburg's advantages, it is not mined today because it is only 12 to 15 inches thick and because it is covered by the Toronto limestone, a thick layer of rock that must be removed to get to the coal. Still, the Williamsburg is considered a reserve that could be important some day. 42.2 (170.2) Exposures of the Plattsmouth limestone on the south side of the road. K-273 goes south 0.5 miles to Williamsburg, which was named after William Scofield, a local farmer. This town provided the name for the Williamsburg coal bed, a part of the Lawrence Formation that crops out in this area. 43.0 (169.4) Shale in the Lawrence Formation is exposed north of the highway. 43.2 (169.2) About 2.5 miles to the south was the town of Silkville, an experimental utopian colony established by the Frenchman Ernest Valeton de Boissiere in 1869. Boissiere helped to bring in French immigrants, and he started a silk factory, with looms that produced as much as 300 yards of finished material a day. Later he gave up silk as unprofitable, and the community turned to dairy production. In 1894, Boissiere died in his native France. Even though his experiment failed, silk became a popular commodity, which was produced in forty Kansas counties from 1889 to 1900. At one time the State Board of Agriculture even organized a special silk station at Peabody. 43.4 (169.0) East Branch of Tequa Creek. 44.4 (168.0) Osage/Franklin county line. Franklin County was named for the colonial statesman Benjamin Franklin. 44.6 (167.8) Plattsmouth limestone on both sides of the highway. 45.1 (167.3) South Branch of Tequa Creek and an exposure of shale in the Lawrence Formation. 45.5 (166.9) Plattsmouth limestone on the south side of the road. 48.2 (164.2) Kereford limestone, another member of the Oread Formation. In places it contains oolites, small spheres of calcium carbonate that have formed around some sort of nucleus, such as a grain of quartz. These spheres range up to .07 of an inch (or 2 millimeters) in diameter, about half the size of the lead shot used in shotgun shells. The word oolite comes from a Latin translation of the German word Rogenstein, or roe stone, so called because an oolitic limestone may have the bumpy appearance of fish eggs. These features supplied the name for Oolitic, Indiana, a town in the limestone-producing region of that state. When oolites grow larger than .07 of an inch, they are called pisolites, a word based on the Greek word pisos, meaning pea, which aptly describes their size and shape. 48.8 (163.6) Plattsmouth limestone is exposed in a quarry north of the highway. 49.4 (163.0) Plattsmouth limestone, which, at 15 to 30 feet in thickness, is the thickest member of the Oread Formation. 49.8 (162.6) Kansas Highway 31 goes south to Waverly. 51.8 (160.6) K-31 leads north to Melvern Lake and the town of Melvern, the source of whose name is thought to be a Welsh word meaning "bare hill." With Melvern Lake and Pomona Lake, Osage County is the only county in the nation with two federally constructed reservoirs. 52.9 (159.5) Beil limestone. Pennsylvanian limestones contain a variety of fossils, which can be collected at Kansas road cuts (although it is illegal to stop along the interstate for any reason other than an emergency). While fossils are usually found embedded in the limestone, they can often be collected by simply picking them up from the ground near an outcrop. Fossils often have a different composition than the rock in which they were embedded, so they may simply fall out as the surrounding rock weathers away. In some places, for example, fusulinid fossils have weathered out of the limestone and can be found covering the ground like spilled wheat. 54.2 (158.2) Coal Creek. Coal is not mined today in Osage County, but during the 1880s and 1890s this was the leading coal-producing county in the state. In 1889, 118 mines in Osage County produced 400,000 tons of coal, mostly from shallow shaft mines. Old coal dumps from many of these mines are still visible at the surface. 54.8 (157.6) Beil limestone. This rock layer is full of fossils, an indication of the abundant invertebrate life that populated the Pennsylvanian seas. 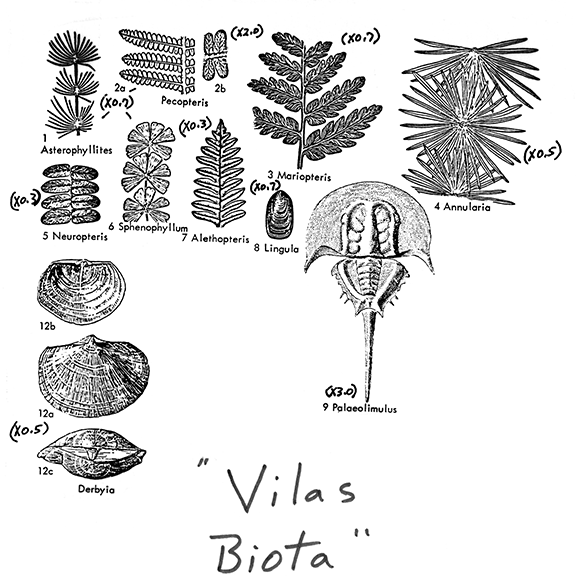 Among the fossils found in the Beil are brachiopods, bryozoans, fusulinids, mollusks, and cornucopia-shaped horn coral. The hard body parts of the horn coral have often been chemically replaced by crystalline calcium carbonate, so that the fossils have a characteristic sparkle when broken. 55.4 (157.0) At this point the highway passes over a fault that was discovered by a geologist from the Kansas Department of Transportation. A fault is not a crack in the ground; it is a location where rock layers have moved relative to each other. This fault has a displacement of 20 to 30 feet. That is, rocks that were in the same layer before the fault moved are now 20 to 30 feet apart. Because this fault is in the subsurface, it is not visible from the road. However, faults can be seen at the surface in several locations in Kansas, including one of the rocks that line the spillway at Tuttle Creek Reservoir, near Manhattan. 55.9 (156.5) Coffey/Osage county line. Osage County is named for the Indian tribe that occupied this part of eastern Kansas before being moved to a reservation along the southern border of Kansas in 1825. 56.4 U.S. 75 interchange. The intersection of these two highways is called Beto Junction. "Beto" is formed from the first letters of four towns that can be reached by these two highways: Burlington, Emporia, Topeka, and Ottawa. 58.1 This paved road is the former route of U.S. 50. Old Beto Junction is two miles east of here. 58.9 Ervine Creek Limestone Member of the Deer Creek Limestone. 60.4 Ervine Creek limestone, covered by crown vetch, a plant that was introduced to the U.S. from Europe and is often found along roadcuts, creek banks, and rocky prairie ridges. 62.2 The town of Halls Summit is to the east. 65.2 Coffey County airport. The Wolf Creek Nuclear Generating Station, the only nuclear power plant in Kansas, is visible on the horizon to the southeast. It was constructed by Kansas City Power and Light Corporation and Kansas Gas and Electric Company; it went on-line in 1985.The plant does not have the large cooling towers that are associated with many nuclear facilities; instead, it uses a large reservoir as a source of water to cool the plant. 67.4 Road to the Wolf Creek Nuclear Generating Station. 68.0 New Strawn. The original site of Strawn was inundated by John Redmond Reservoir in the early 1960s and the town was moved to this site. It is named after Enos Strawn, one of the town founders. John Redmond was a local newspaper editor who is generally regarded as one of the first newspaper men to study under William Allen White in Emporia. The reservoir, barely visible to the southwest, bears his name because of his efforts to bring flood control to the Neosho River valley. 70.4 Heumader Shale Member of the Oread Formation. 71.1 Neosho River. The Neosho has its headwaters in the gravel-bottomed streams of the Flint Hills of Morris County. It cuts southeast and exits Kansas in Cherokee County. 72.0 Burlington, the seat of Coffey County. The town is probably named after Burlington, Vermont. The towers to the west are from the grandstands at the Burlington High School football field. 73.0 Neosho Street. Before John Redmond Dam was constructed, the Neosho River and Rock Creek flooded the town at least twice. One of the more devastating floods resulted in water up to the first-floor awnings along Neosho Street. 76.5 Chert gravels form the low mounds east of the road. The original source of this chert is probably the Flint Hills, west of here. The chert was deposited here during the Neogene Period, about 2 to 25 million years ago, although an exact age of deposition is difficult because of the lack of paleontological evidence. These cherts were probably deposited by an ancestral Neosho River, although notice that we are high above the present-day Neosho River Valley. 79.8 Kansas Highway 57 leads west to Gridley. 79.9 Toronto limestone overlain by a sandstone in the Snyderville shale, both members of the Oread Formation. 80.4 Lawrence Shale overlain by the Toronto limestone. 82.6 Sandstone in the Snyderville shale. 83.8 Coffey County/Woodson County line. 85.8 County road to Neosho Falls to the east. 86.5 Toronto limestone. 88.3 The Liberty Dutro Cemetery. 89.2 Rest stop. 91.9 The Ireland Sandstone Member of the Lawrence Formation is exposed southwest of the road. 94.5 Yates Center, the seat of Woodson County. One of the signs leading into town from another direction proclaims that Yates Center is the hay capital of the world. 94.9 Intersection of U.S. highways 75 and 54. 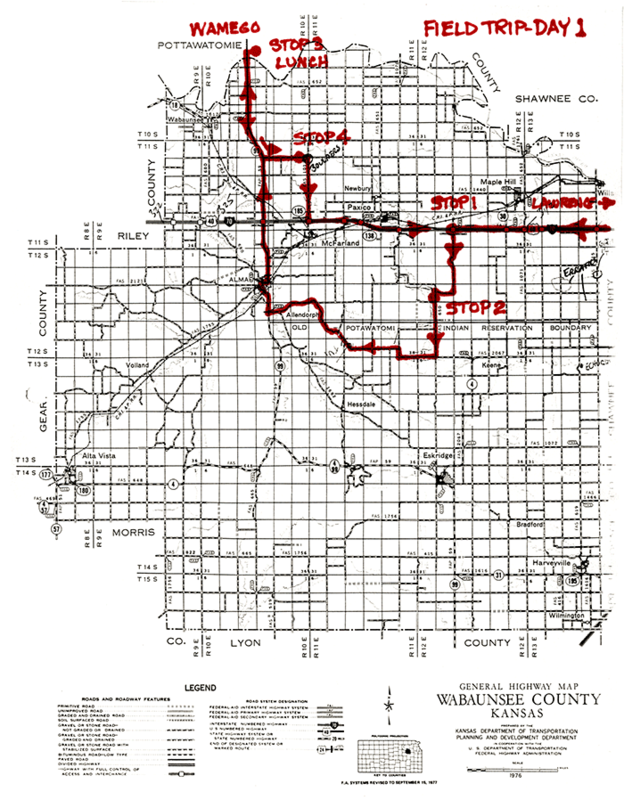 U.S. 54 runs west to Wichita, then angles to the southwest, leaving Kansas near Liberal. 102.5 The Rose Dome is west of the highway. Igneous rocks are extremely rare at the surface of Kansas. This dome represents an area where a lamproite--a pipe of igneous rock--worked its way to the surface, probably during the Cretaceous Period, about 100 million years ago. Igneous rocks from that lamproite are found in the pasture west of the highway. The lamproite also created a rounded, dome-like feature that is identifiable on topographic maps. 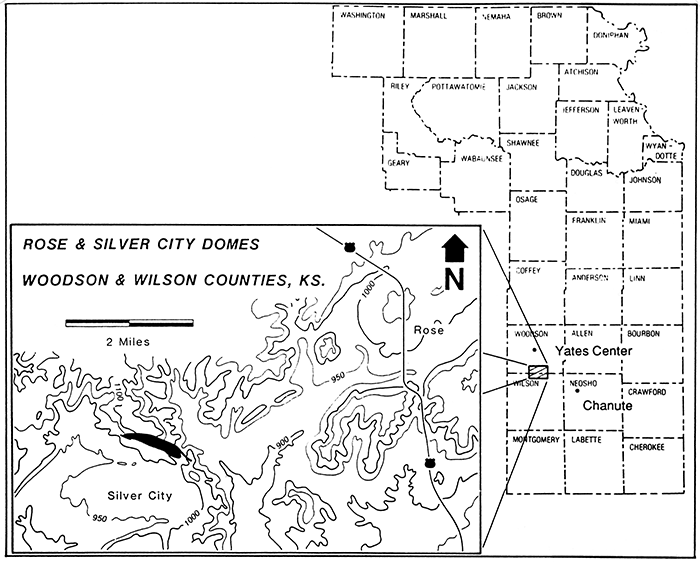 Index map showing the location of the Silver City and Rose domes in southeast Kansas. 103.4 Limestone quarry on the east side of the road is in the Stranger Formation. 106.2 County road to Buffalo to the west. Wilson County/Woodson County line. 108.1 Micro-lite Street, Buffalo. Turn west (or right) on this street, which is named after the mine we will visit. The road goes past Haley's Double Tuff Ranch, where longhorn cattle are raised. 108.6 Stop sign. Continue west. 109.0 Micro-lite elevator and railroad tracks. 109.8 Creek crossing. End of black-top road. 111.2 Stop sign. Go north. 114.6 Oil field. Turn west. 115.6 Entrance to Micro-lite mine. STOP 1. 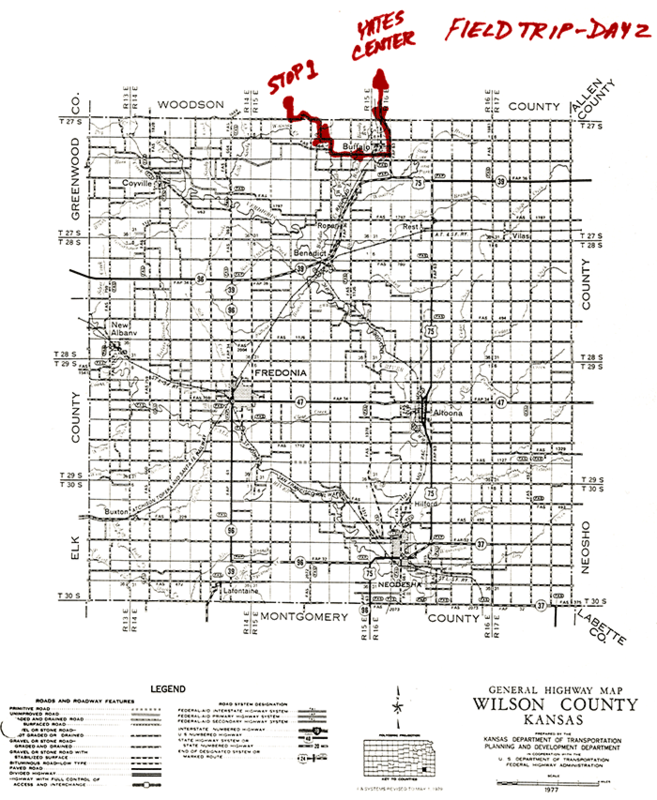 We will visit Silver City dome located about twelve miles south of Yates Center at the boundary between Woodson and Wilson counties. Silver City dome, together with Rose dome about seven miles to the northeast, is one of several interesting geologic features that have been interpreted as volcanoes that exploded to the surface 90 million years ago. The volcanic rock, called lamproite, is a rare basic rock that contains large amounts of a kind of mica called phlogopite and occurs only in a few places in the world. Economically, the rock is important for several reasons. The world's richest diamond mine in western Australia is a lamproite. At Silver City dome the lamproite occurs at or near the present-day surface at the northern perimeter of the dome as shown in black on the accompanying figure. Close to the surface the lamproite is weathered to an olive-brown soft material, while deeper down it changes to a harder darker rock. The soft rock is mined by a Kansas company, called Micro-Lite, Inc., and is widely used as an ingredient in cattle feed. Small amounts of the light-colored clay-type rock makes an excellent binder when added to pellets fed to cattle. Furthermore, the minerals present in the rock add small, but essential, amounts of magnesium, potassium, and iron to the cattle feed. Other uses in agricultural applications and in the plastics industry have been and are actively being researched. The rock being mined at Silver City dome is hauled by truck to the small town of Buffalo about six miles to the east. Here the material is further processed and packaged for shipment. We would like to thank Mr. Jeff Dyer and Mr. Bill Beck of Micro-Lite for their permission and cooperation to visit the mining property. Retrace route to U.S. 75, then north to Burlington. 160.1 Neosho Street, Burlington. Turn east. 160.2 Country Critters industrial complex, on the south (right) side of the street, manufactures a variety of amazingly lifelike hand-held puppets. 161.0 Turn north (left) on Native Road. 161.4 Turn east (right) on 12th Road. 162.4 Turn south (right) into quarry. To the east is one of main dams that forms the reservoir for the cooling the Wolf Creek power plant. 162.6 STOP 2. Abandoned quarry in Plattsmouth Limestone Member of Oread Limestone. Also exposed here is black shale (Heebner Shale Member) below the Plattsmouth and fossiliferous shale (Heumader Shale Member) above the Plattsmouth. Fossils weather out along the slopes of the shale above the limestone at this quarry. Be sure to note the difference between sponges (the most common fossil here) and the crinoid stems--sometimes it isn't so easy. Most geologists think that the black shale at the base of this section represents deep water and that the water became more shallow upward through the Plattsmouth and into the Heumader. At the extreme top of the exposure is a thin deposit of the Neogene chert gravel. Return to 12th Road. 163.8 Turn north (right) at Native and 12th Road intersection. 165.8 Turn west (left). Wolf Creek power plant is visible to the northeast. 166.6 Kereford Limestone Member of the Oread Formation. 166.7 Intersection with U.S. 75. Turn north (right) and retrace route to Lawrence.